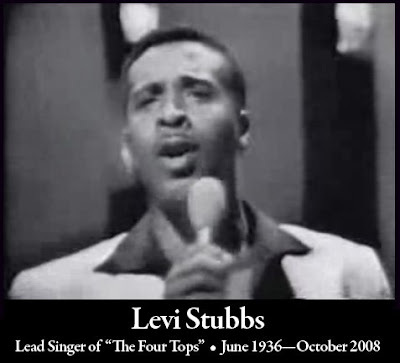 A little bit of “me” died this past weekend when I heard about the passing of Levi Stubbs, the fearsomely talented lead singer of Motown's “The Four Tops”. There are what you call “sense” memories. And one of my deepest sense memories is the piercing, emotional baritone (reaching tenor notes!) of Levi Stubbs singing at his peak powers. The beginning of my retentive memories starts at three years old—The Summer of 1966—and the voice of Levi Stubbs was not only ubiquitous, but hitting on all cylinders that year, thanks to his growing talent and to the rapidly maturing songwriting craft of Eddie and Brian Holland, and Lamont Dozier, Motown Records' hitmaking tunesmiths par excellence. The songs “Shake Me, Wake Me (When It's Over)”, “Seven Rooms Of Gloom”, “Standing In The Shadows Of Love”, the driving single “Bernadette”, and lastly, but not least, “Reach Out”—that ominous, pleading paean to devotion were all major mega-hits in that first year of memories for me. Stubbs' voice leapt from curbside and window-silled speakers all over Harlem in 1966-'67, knifing through the oft-times murky Motown mono mixes he sang over. He was, one of the five best Soul singers of the 1960's (The other four being The Temptations' David Ruffin, Marvin Gaye, Otis Redding, and The Dells' Marvin Junior), capable of soft balladeering and the rough-and-tumble shout—sometimes within the same song. He had a pleading, cajoling tone, and was at his best amidst a swirling maelstrom of sound, his voice fighting through the wind if you will, especially on songs like the aforementioned “Standing In The Shadows Of Love“ “Bernadette” (with that almost screamed “Bernadette!” solo blast at the song's 7/8 mark) and the magnum opus “Reach Out”. That last song stays with me to this day, with Stubbs embattled vocal declaring his faithfulness to the end—how no one, or no thing would stop him from being there for “you”. It was gruff and heroic, yet shot through with an almost “yelp” of human vulnerability. He powered through the tune's swirling sonics with that mighty, and near-inimitable voice of his (only “The Chairmen Of The Board's” General Johnson could come close stylistically—listen to their “Give Me Just A Little More Time”—a post-Motown Holland-Dozier-Holland gem sporting a decent Stubbs impersonation) and cemented it as a sixties musical landmark, epitomizing “The Motown Sound” with perfection. His rich voice and deft handling of the challenging song (Stubbs' could do show tunes and soft-pop covers as well as the raspy R&B shouters and while he was a baritone, his Motown hits were written in tenor range, giving his sound a more insistent, edgy timbre) made it an automatic classic, but it was twenty-some-odd years later when hearing that song would give me chills all over again. Henry Hampton used it in a segment of his brilliant “Eyes On The Prize” documentary. I watched that segment, Chapter 7: The Time Has Come in rapt attention, but it was the climax of the “March Against Fear” footage in it when The Four Tops' “Reach Out” rises ominously in the audio mix. The song takes on a whole different meaning, almost anthemic in its sound and message. It wasn't the first song of its time to serve “double duty” as pop tune and protest song, but it was one of the rare semi-unintentional ones (along with Martha & The Vandellas' “Dancin' In The Streets”). I asked a few people who were older than I about this song and to a letter, they noted it as a theme for the time, a couple of them citing Stubbs' indomitable sound as a near marching order. But in spite of all the stupendous talent within him, Levi fought off the thing that claimed virtually every one of his contemporaries who led a major vocal group—namely the siren song of record company execs warbling tunes of solo stardom. As one of the best singers working, Stubbs was tempted numerous times to leave his fellow “Tops”. How could he NOT be? His sound was so distinctive, and a proven hit-machine—the Billboard™ Pop numbers show it unequivocally. But he never did. Stubbs stayed with the group from its inception as “The Four Aims” in 1954 until 2000 when illness from cancer and a series of strokes would effectively silence his mighty sound. The lone surviving original member of the Tops, Duke Fakir had this to say about his old friend and groupmate. He was as loyal as could be. Perhaps he could have done better had he gone solo, but Stubbs was an old-school group singer. I have a special respect for that. My dad was in a seminal R&B singing group so I know a bit about the pressures and dealings those folks go through based on my father's sharing about those numerous perks and pitfalls. I think of how good Levi Stubbs was—a true, “no-drama” professional at his craft. He stood with very few others atop the pinnacle of greatness in the undeniable “Golden Age” of soul singers. A peer of both “Marvins”, gutbucket Otis and the mercurial Ruffin, and just a tick above the Smokeys, Curtises, “Wicked Picketts” and Jerry Butlers of his time. He would with The Tops continue to chart after that “peak” with one of my favorites, the now-rarely heard “I'm In A Different World” from the “Yesterday's Dreams” album (one of the coolest Soul album covers of my youth), the incandescent “Still Water (Love)”, “Ain't No Woman Like The One I've Got” (the first big post-Motown hit for The Tops and Stubbs), all the way up to 1982's “I Believe In You And Me”. His voice was a rare blend of power, vulnerability, joy and yearning. It was a signpost for an era, and a deep and heartfelt sense memory for me. I know I'm not alone in missing him as he belonged a little bit to all of us who enjoyed his work, but Dammit...it pains me deeply as I see one by one, these icons of my youth fading out. But again, thankfully, we have their performances preserved in the amber of video on YouTube. Forever young and vital, swaying and clapping, and moving the crowd. Levi...baby, we'll miss your singing. Godspeed.